UK economic growth forecasts were heavily downgraded by the Bank of England in its quarterly Inflation Report today. UK GDP growth is now expected to be 1.2% this year, against previous forecasts of 1.7%, the lowest since the financial crisis. The Bank also warned that a no-deal Brexit could trigger a recession. The chance of a no-deal Brexit has gone up, Governor Mark Carney said, but Britain's Cabinet is actively discussing the possibility of extending the date of Britain's departure from the EU. Current economic conditions are reasonably benign, despite weakness in PMI surveys for January and signs of a slowdown in the housing market. 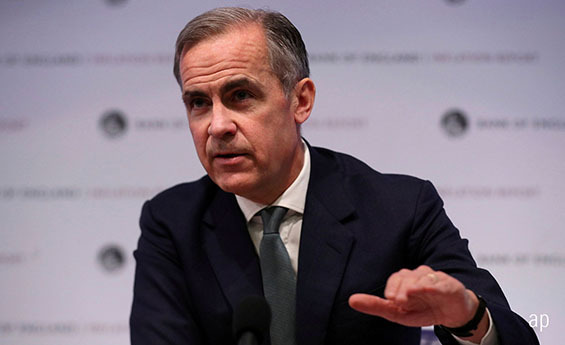 Carney said that under a soft Brexit, the Bank of England is expecting wage growth, inflation, and higher investment by firms. He also put down the idea of an interest rate cut to boost the economy through and beyond the Brexit period. "Domestically, a tight labour market means wages are growing at their fastest pace in a decade. This would usually prompt policymakers to consider raising rates, but a deteriorating global growth outlook and mounting Brexit uncertainty have put paid to any thoughts of tighter policy for now," said Hargreaves Lansdown's senior economist Ben Brettell. The nine-strong Monetary Policy Committee voted unanimously to keep Bank Rate at 0.75%. Financial markets are not pricing in an interest rate rise until Britain has left the European Union, with November pencilled in by economists for the next hike. In the UK central bank's latest set of economic forecasts, inflation is now seen above the 2% target over the coming years. The pound initially fell back towards $1.285 on the news but recovered during the press conference held by Mark Carney and colleagues. Capital Economics said after the announcement: "The Bank of England today emulated the Fed by sounding more dovish and implying that interest rates may not need to rise as far as it previously thought. We still think that a decent rebound in GDP growth, should a Brexit deal be reached, will result in interest rates rising further than the Bank and the financial markets assume. But the risks to our forecast are on the downside." Central banks in the developed world have rowed back on the narrative of monetary tightening in recent months. Australia's central bank is now expected to cut interest rates, an idea that pushed down the Australian dollar today. The Federal Reserve's caution on rates this year gave stock markets a lift in January.